We drove to the nearby El Prado Museum, which is one of the top museums in the world! It feels like you are walking to Buckingham cause it has that palace feel to it. Here we saw original paintings by Raphael, Botticelli, Rembrandt, and others. It is huge, and you wont be seeing the entire thing not even in a whole day. But if you plan what you wanna see, then you’ll take the “I was there” emotion when you talk to someone. We heard from one of the many guides that there was a beautiful park to the other side that is pretty neat for all couples. Jackson and Sandy, Ms Hotness Alejandra and I, we all looked at each other and agreed that we have to go there. It is called “Parque del Retiro” (or the Retirement Park). We were told that we got into the best time of the year, the whole park was blossoming with flowers of such bright and distinctive colors where every place you look it was a postcard. 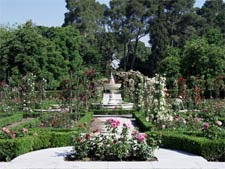 If you come to Madrid, don’t forget to come here, it is a romantic spot! We follow the road to a community near Madrid called San Lorenzo de El Escorial, where a famous Basilica or Monastery resides. It is the place where many of the kings and queens of Spain have been buried. Also houses priceless works of arts and important documents that aren’t found anywhere in the world. It is a marvelous place to be and to admire. The architecture and the hugeness of the place will certainly make you shoot picture after picture cause it is that beautiful. The night was beginning and we stop to refresh a little and went out at night to one of the many Tapas or bars around the area. Many of them are a combination of Tapas and flamenco, which is a very unique dance. The festive atmosphere and the tapateo’ as they called the tapping of the shoes in the dance is something memorable. The girl who was doing the dance routine did it with sucha panache and very seductive that there were moments where you could hear the pin drop. At the end, she received a well awarded round of applause and we all scream “Bravo!”. This first night in Madrid was awesome, cant wait to tell you what happen when we visited Paulina, poor Martin was out cause he was working, however, for the game, certainly was something for the posterity!